Artist's rendition of Benjamin Eby's Meeting House, 1813 building. First Mennonite Church, Kitchener, 1834 building. Source: Mennonite Archives of Ontario. First Mennonite Church, Kitchener, ON. In the late 1700's a steady stream of Mennonites began migrating from Pennsylvania to Upper Canada. Establishing communities en route, this migration continued northward reaching the German Company Tract (now part of Waterloo County) by the early 1800's. Predominantly farmers and a few millers, these people carved a settlement in the wilderness with a nucleus in what is now downtown Kitchener. This community was known as Eby's Settlement, later Eby's Town, Berlin and finally Kitchener. From 1804, pioneer families met for worship in homes and later in a schoolhouse. 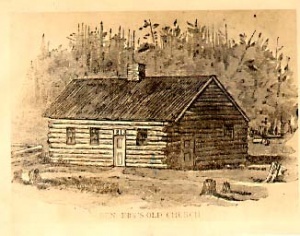 By 1813 more space was needed and a log building, known as Benjamin Eby's Meeting House, was erected. This church and an adjoining cemetery were the first in the area. A larger frame church was built in 1834 and was replaced by a brick church in 1902. This building remains the center section of the present day church. Additions to the structure were made in 1927, 1949-50, and 1985. The church became known as First Mennonite Church in 1917. Sunday School classes for children were begun as early as 1841, combining the teaching of the German language with Christian Education. In 1907 the church became home to the Ontario Mennonite Bible School, which held classes for adults during winter months and attracted students from across North America. This program continued until the 1960's. Under C. F. Derstine's leadership, the first summer Bible School was held for the community in 1928 with an enrolment of 243. This program has continued annually. Over the years groups of members from First Mennonite church left to form other congregations in the city. These include Bethany Missionary Church in 1875, Stirling Avenue Mennonite Church in 1924. Rockway Mennonite (1960) and the Baden Mission (now Wilmot Mennonite) were outreach efforts of First Mennonite Church. As the community changed dramatically over the years from rural to urban, from Pennsylvania German to multi-ethnic, the church reflected these changes. Following the sponsorship of several Southeast Asian refugee families in 1979, a group of Hmong from Laos began using the facility on Sunday afternoons for worship and Sunday School in their own language. Several years ago they moved to their own building and named their congregation "First Hmong Mennonite Church." Since 1986 some of the Hispanic refugees coming to K-W from Central and South America have become an integral part of First Mennonite Church. 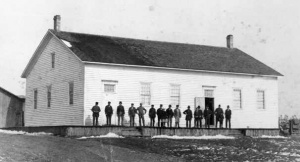 The Ontario Mennonite Bible School and Institute, started in 1907 by the Mennonite Conference of Ontario, was held at First Mennonite for many years. Community groups, which have used the church facilities on a regular basis, include Our Place Family Resource Centre, Live and Learn (House of Friendship), Narcotics Anonymous, Alcoholics Anonymous, and Community Justice Initiatives. In 2003 worship services preceded by Sunday School classes for all ages, including adults, were held each Sunday with Spanish Worship Services held on the second and fourth Sunday of each month. Children's ministries included Venture Club, Vacation Bible School, and Junior Youth activities. A youth/advocate program, faith exploration classes and fellowship activities were offered for youth. Adult activities included Women's Mission and Service Commission, small groups Faith exploration classes, Spanish Bible Studies, Senior Fellowship and Visitation. Community Life, inter-generational services and social events were held regularly. Mennonite Reporter (18 February 1974): 1; (10 June 1985): 13; (1 May 1989): 16. CMC Nexus (February 1996): 10. Burkholder, L. J. A Brief History of the Mennonites in Ontario. Kitchener, ON: Mennonite Conference of Ontario, 1935: 73-77. Cressman, J. Boyd. "History of the First Mennonite Church." Mennonite Quarterly Review 13 (July and October 1939), 60 pp. Bauman, Salome. 150 Years: First Mennonite Church, 1813-1963. Kitchener, ON: The Church, 1963, 24 pp. Good, E. Reginald. Frontier Community to Urban Congregation : First Mennonite Church, Kitchener, 1813-1988. Kitchener, ON: First Mennonite Church, 1988, 160 pp. Congregational records at Mennonite Archives of Ontario. An 30-second audio clip of C.F. Derstine from a 1956 sermon in Pennsylvania can be heard. Burkhard, Barbara. "First Mennonite Church (Kitchener, Ontario, Canada)." Global Anabaptist Mennonite Encyclopedia Online. July 2003. Web. 24 Apr 2019. http://gameo.org/index.php?title=First_Mennonite_Church_(Kitchener,_Ontario,_Canada)&oldid=143560. Burkhard, Barbara. (July 2003). First Mennonite Church (Kitchener, Ontario, Canada). Global Anabaptist Mennonite Encyclopedia Online. 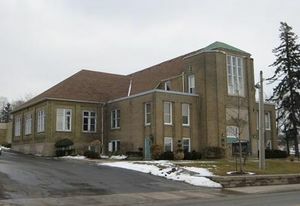 Retrieved 24 April 2019, from http://gameo.org/index.php?title=First_Mennonite_Church_(Kitchener,_Ontario,_Canada)&oldid=143560.